For this version, I wanted an easy, modern Christmas decoration. I chose classic Christmas colors, but feel free to experiment! You can dress this up or down to fit your own Christmas décor. This garland would look great in metallic scrapbook papers and satin ribbon, or even kraft paper and twine. It looks lovely draped across windows and doorways or around a Christmas tree. 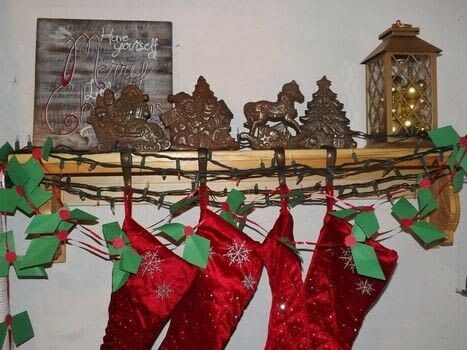 With a few clothespins, it can also serve as a hanger for Christmas cards. This project should be suitable for children you trust with scissors. If you are using hot glue rather than craft glue, I suggest adult supervision. You could certainly substitute more detailed berry and leaf shapes. NOTE: I estimated 1 cluster of leaves and berries for every six inches of length. You will need at least 2 leaves and 2 berries for each cluster. 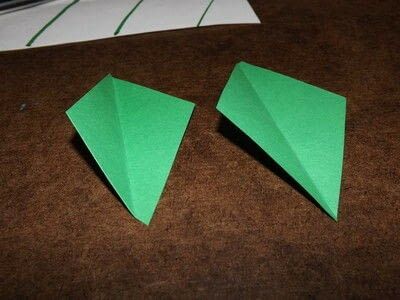 See how many leaves you get out of a sheet to know how many sheets of green you will need. I think I used about 5 sheets for 20 feet of garland. Measure the space where you want to put your garland. 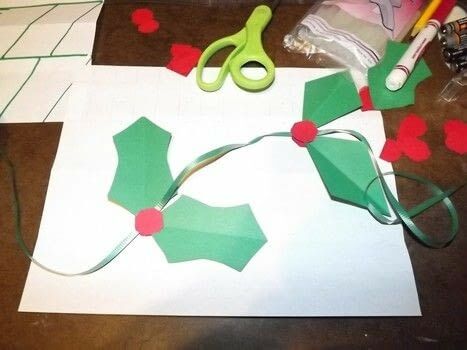 You can use the ribbon you will be adding paper to or a piece of string or yarn, and drape it over the space like you would the garland, allowing for swags and hanging ends. 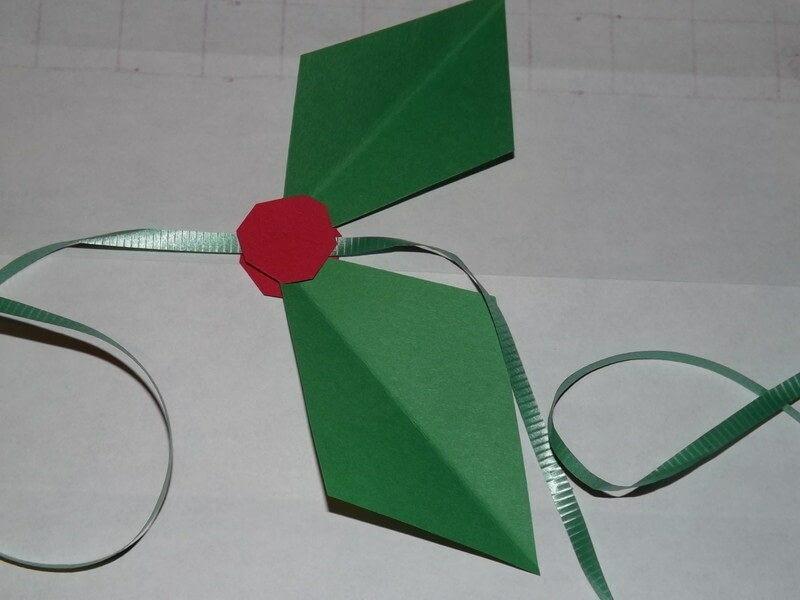 I like to add at least 2-3 feet of extra ribbon at each end to tie or hold the garland with a small ribbon weight. In my example, it worked out to approximately the width of the space + 1 foot for each drape + 3 feet for each each end. 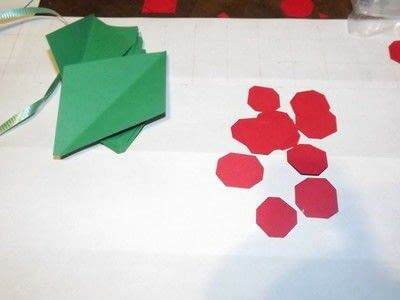 You will need at least 2 leaves for each cluster. I mixed and matched leaf sizes, but you can cut it however you like. 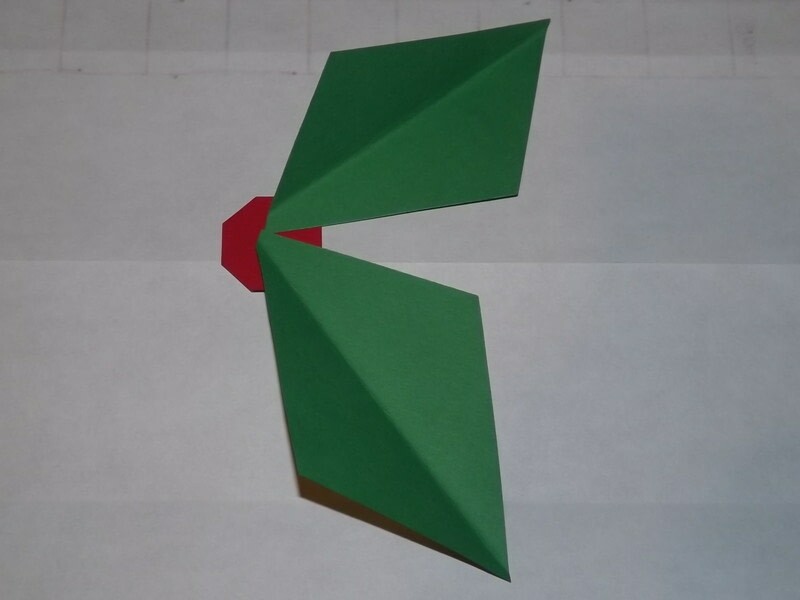 I made a simple holly leaf with a long diamond shape. Fold a piece of green paper (8.5'' x 11”) into three sections (or 4 sections for smaller leaves) lengthwise. 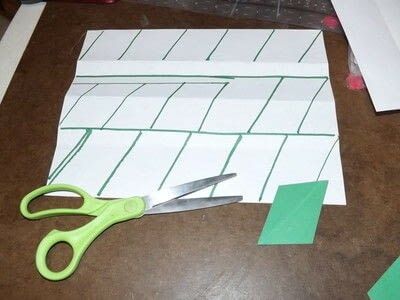 Cut the paper into strips along the folds. Then cut the paper at an angle across the strip to make the diamond shape. Shown on white paper for visibility. 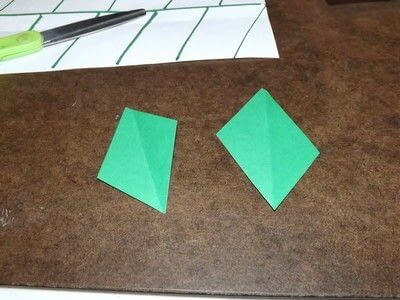 Fold the diamond shape from corner to corner lengthwise, then open, leaving the crease. You will need at least 2 berries for each cluster. I made a simple circle shape by cutting small squares and trimming the corners so they became octagons. 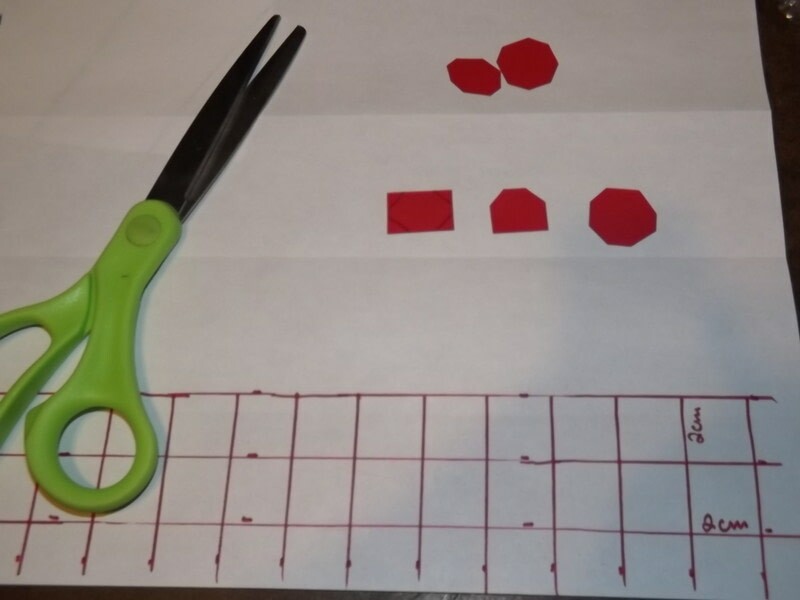 You can use a circle cutter or paper punch or anything else to get a berry-like shape. 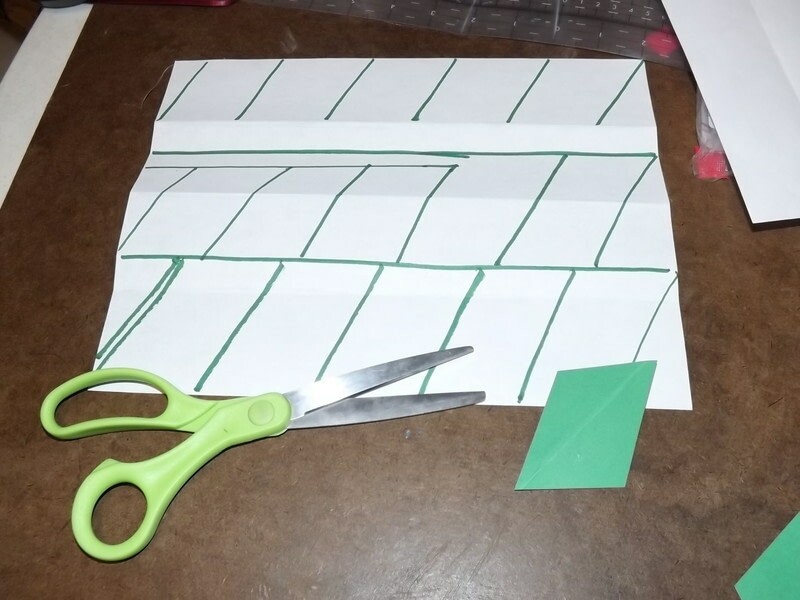 I cut a piece of green paper (8.5'' x 11'') into strips ¾'' (or 2 cm) wide. Cut the strips into squares. 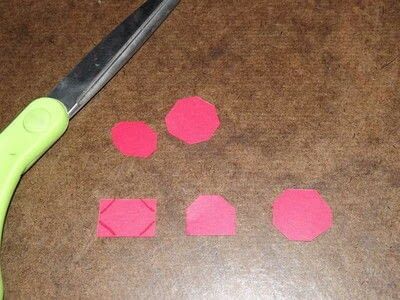 Then trim the corners of the squares diagonally, just a small amount, to make the square more circular. Heat up that hot glue gun. Put your leaves and berries in easy to reach piles. Use a heat proof surface and protect your work space with newspaper or aluminum fool. Repeat this for all of the leaves. After this, you should have half of the berries remaining. Measure and cut your ribbon (leave yourself extra if you can, just in case). Decide where you would like the clusters of leaves and berries to start. Apply hot glue to the back of one of the clusters from step 4. 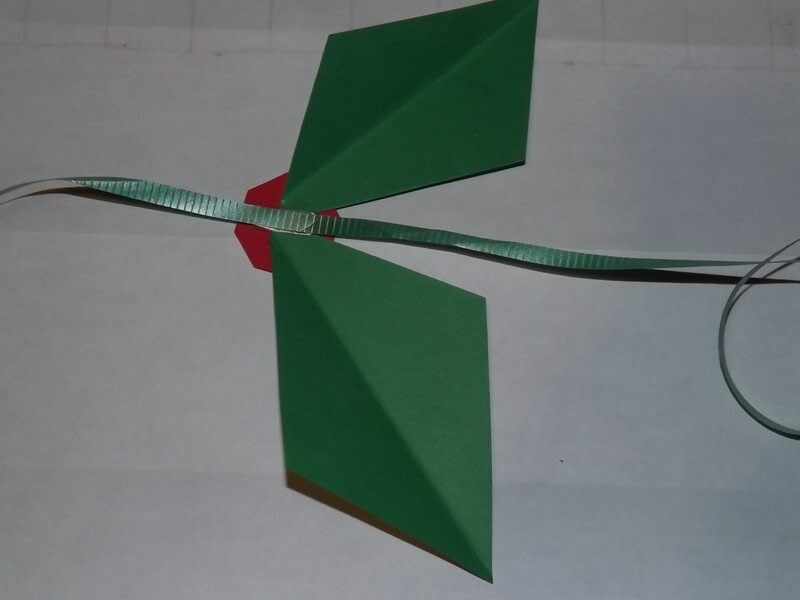 Lay the ribbon on top of the hot glue, between the top points of the V shape. 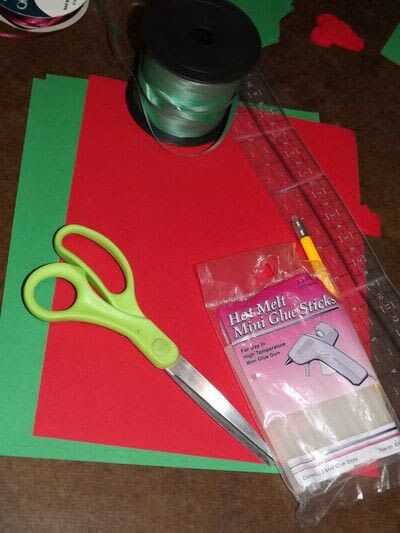 Apply more glue on top of the ribbon if needed. Apply a single berry without leaves, front side up, to sandwich the ribbon between the single berry and the piece from step 4. Place the next cluster about 6'' from the first one. Repeat for the length of the ribbon. Allow to cool or dry completely before hanging. You can substitute more detailed leaves and berries. Simply use the same steps for assembly.